The German battleship Scharnhorst was built at Wilhelmshaven shipyard. It was initially designed as a heavy cruiser, then battleship, matching up to French Dunkerque-class ships. The ship was laid down on 15 June 1935, launched on 3 October 1936 and commissioned on 7 January 1939. 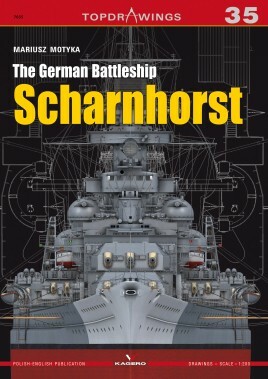 During her service Scharnhorst underwent numerous rebuildings and modernizations, the most important were: bow reshaping, enlargement of aircraft hangar, relocation of the catapult to the roof of the hangar, removal of the mast from the funnel, construction of new tripod mast situated behind the hangar, installation of degaussing coils along the sides, replacement and strengthening of antiaircraft armament, rebuild of radio compartments on the main rangefinder (conning tower), installation of FuMo 27 and FuMb 4 radars with antennas, and expansion of admiral's bridge.